As members of an overseas military community, working in schools on military installations, it's pretty much a given that many of the parents and family members who join our PTAs will be in the military. However, we often forget that there is a huge population outside of our schools that may be interested in supporting our communities, our schools, and our students by joining PTA! Reach out to your communities for membership. Hold membership drives at your Exchange. Run a table at your local volunteer round-up event. Talk to local military units or service groups about setting up a sponsorship or partnership with your school. If you have an idea on how your PTA can reach out to the local community, give it a try! Whether the community members who you'll meet can offer volunteer hours or just support as a member of your PTA, they will enrich your school's experience. 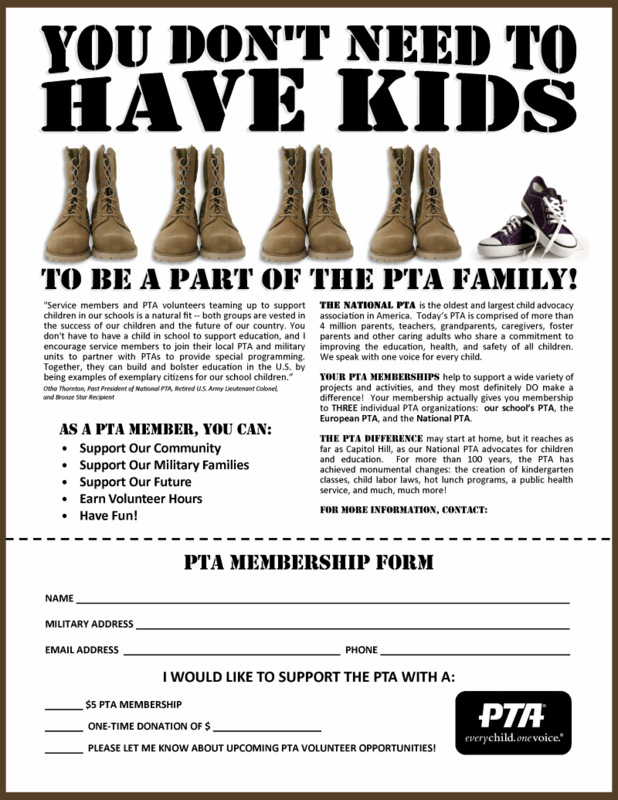 The flyer below is one example of how you can reach out to non-parent military members and other members of your local community to enlist their support for your PTA. The link at the bottom of the page gives you an editable form that allows you to add your PTA's point of contact and other key information.